Why does a child decide to run away and disappear? What are their feelings, thoughts and fears while they are missing? 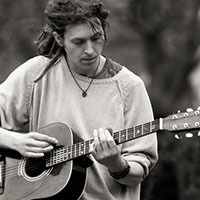 Singer, writer and ex-runaway Ben Westwood decided to share with Missing People his touching experience of going missing, leaving his native Staffordshire for London. He recalls the worries that made him run away from home, the dangers encountered when living on the streets and his final return home also in his self-published book "Poems from a Runaway". “You have no idea what I went through at night. Perhaps if I had been two or three years older, I would have ‘got it’. But at the age of 11 as a runaway child, and having never met any predators on my journey yet, how was I to truly understand what my mum had been saying upon all of my returns at that age. In most eleven year olds' world, people only get harmed like that on TV and in the movies, and for most of us the creepy characters we’d known as ‘strangers’ were mainly hearsay and folk law. By eleven years old, I wasn’t only walking miles on end at all times of day and night, but hitch-hiking across Staffordshire and the West Midlands. Of course when I got into cars with people I didn’t know, I’d been somewhat on guard if something weird did happen, but I was genuinely naïve about my levels of safety in a dangerous world. I didn’t know about child trafficking, psychopaths, sadists or pedophiles. Often a small town kid’s mind hasn’t opened up to all that yet, and it wasn’t until I went through some of my own darker experiences in the following years to come, that I’d realised how damaged and dangerous some people can be. My own personal experience was that I hadn’t felt happy at home. No one’s perfect I guess, but I had a lot of memories of not being welcome there when I was around ten years old, and I think it all started at a period where my older football mates had started to grow up and move on and I was left with a gap in my life of having nothing to do and nowhere to go. My mum had met a new boyfriend that she ended up settling down with and there seemed to be some sort of personality clash thing going on between us. I’d say there wasn’t any physical abuse, but I’m not sure what else I could define being told to stand up against a wall for over an hour with my hands behind my back and leaning against the wall with my nose. My mum said in the following years that it was because he was young (24) and inexperienced with children. But I’d always felt a little bullied by him, perhaps not always overtly and forcefully, but more subtly where I’d really feel he was trying to get under my skin. Eating on my own at the other side of the room, whilst he tried to get my younger brother and sister to taunt me about it and poke fun at me. I’m not wanting to start a witch hunt on the guy though, unfortunately these problems are everywhere, and I think for some children, they tend to get a bit fobbed off by older adults set in their ways at times when the young person tries to express their feelings. The first time I had ever ran away overnight at around ten years old, it wasn’t because I wanted to flee from any violence or harm, but I just wanted to stop feeling like I was letting everyone at home down, particularly my mum. 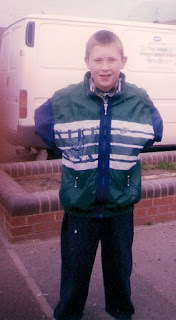 It was after I’d been caught shoplifting a few times, and one day I’d been suspended from school for a few days. I couldn’t face telling her that I’d let her down again. She had a part-time job for a short while in the nearby pen factory, so before she got back I changed out of my school uniform and decided to walk off into the distance. I didn’t have any money or food, but decided to walk to nearby Stafford, but changed direction along the way to head to a place called Stone because the name sounded intriguing. In my mind, I was going to free my mum of the burden that I’d felt I’d been. Of course they’ll worry about my safety at first, but after a while they’ll get used to it and actually be a happier family without me was what I was thinking. I had no clue where I’d sleep or how I was going to survive, I didn’t really think about it and on that particular occasion I slept in a ditch for two nights before waving down a passing car to help get me home, as I stood there soaking wet from the rain and crying my eyes out in desperation. I’d been lucky to have been picked up by a concerned nurse who took me back to her house and called the police. Things at home changed for a while and there seemed to be an effort for us all to get along, but after a couple of weeks the same feelings had surfaced again and I started leaving the house in the middle of the night and going missing again, walking the long roads in-between towns and thumbing lifts. It wasn’t until the following couple of years, at the age of 12 after moving around a few foster placements, that I’d learned about predatory behaviour and what dangers I could find myself in. 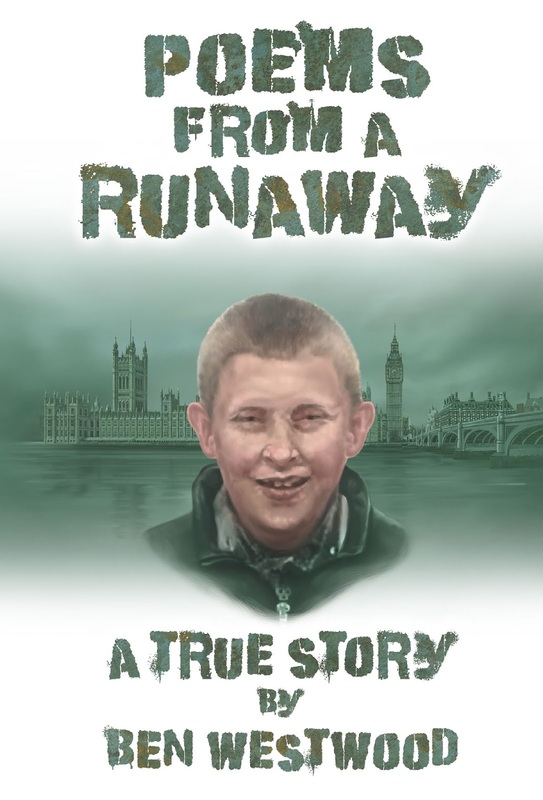 Cover of "Poems from a Runaway"
I’d run off to London and ended up in Whitechapel meeting a thirteen year old runaway girl that ended up being involved with prostitution and hard drugs. On my first night there in London I was held up with a flick knife and robbed, and a few hours later had found myself in a house where police entered looking for a man wanted for murder. 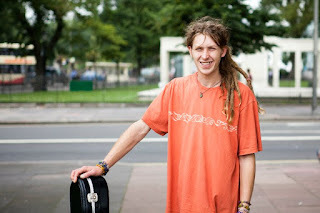 A few months later after being estranged from my runaway friend, I would be befriended whilst visiting a homeless shelter, and held up with a machete and kidnapped before fleeing the east end to live on the streets of Central London. It was from there that I found out about paedophiles and sexual predators. I never told anybody that I met my true age, but often looking young was good enough for some. Whilst sleeping rough near Victoria station I was spiked whilst a man tried to molest me, and for a short few seconds actually did, before I got up whilst swaying and pushing him off. I was so out of it that it was all a blur, like I was seeing stars. Thankfully he scuttled away, but no way in a million years was I in position to physically protect myself. I was lucky, I could have been anybody’s to do anything with. Then in the following months when I set myself at a regular spot in a doorway on Piccadilly, there were the heroin pushers. There was one man who had completely changed everything for me though, a guy that had come and sat down alongside me to give me some incredibly valuable words of wisdom. “There’ll be guys come and offer you gear (heroin) for free. They’ll be nice to you, say that you won’t have to pay them back until later. Indeed they came. Usually blokes in their early twenties, but thankfully because of that one man’s advice I was able to tell the pushers to leave me alone. I’d actually already tried heroin with the guy that had kidnapped me before it all happened, but thankfully as a twelve year old I’d found it boring, and perhaps fortunately had not quite smoked it properly. Like before, if I had been two or three years older perhaps things would have been much different. It’s a dangerous time where young people are more prone to want to numb their feelings. Thankfully for me I was so young that I still wanted bright lights, swirly things and Knickerbocker glories! I learned to cope with it all in the end, develop my own defence mechanisms. I guess that strategy was to not trust many people. Sure using fake names and speaking in false accents helped a lot, and when I told most people that I was sixteen or eighteen or whatever they seemed to just tend to believe it. Personally for me, I think I was lucky to have learned how to keep away from where the trouble and hard drugs were rampant, which is why I slept near the Green Park side of Piccadilly. Only a minute or two’s walk to nearby Oxford Street, Soho or Tottenham Court Road would have meant I was thick in the middle of drug addiction central. I did indeed sleep around those places a few times, but I guess you learn about some things through experience. So I’ve written a book about all my childhood and teenage experiences of being a runaway and also a kid in care called Poems From a Runaway. It’s got 60 poems that are a collection of stories inside my childhood journey, you can read some of it for free on my blog. I’m selling colour copies from the blogsite as well as another version being available on Amazon. A lot of people are telling me that the book is a lot thicker than they expected, I tried to condense it down by writing it all in poetry but I guess there’s a lot of stories that I wanted to tell. If anything I want it to educate people on the effects of family breakdown, but also sometimes how the mind of a young child works. There’s a lot in it relating to children in care and homelessness, and I’m hoping that it becomes a valuable recourse for many support services, social workers and foster parents. If parents and professionals had a better understanding of how to support and communicate with children, perhaps it might prevent them from running away. Or if more children knew how to access services like Runaway Helpline before leaving or whilst away from home, they could get the help they need to be safe. By Ben Westwood, author of Poems From a Runaway.